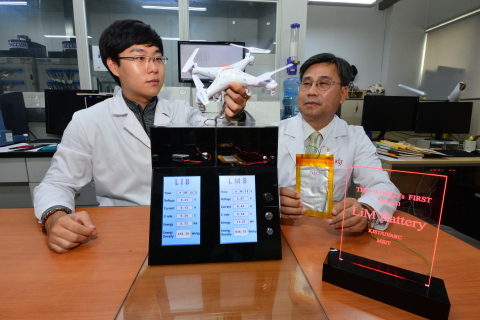 KIST: Enhancing Flight Duration Time of Drones with Lithium Metal Ion Batteries! The Ministry of Science and ICT stated that a new Lithium Metal Ion battery has been developed by the KIST researchers lead by Dr. Won Il Cho. The developed battery possesses twice the energy density that of conventional Lithium Ion batteries, which are commonly used in smartphones and portable computers. The developed Lithium Metal Ion batteries are capable of maintaining 80% of the initial performance after going through more than 1,200 charge/discharge cycles. The technical lithium battery works were published in ‘Nature Energy, IF(46.859)’ on September 25th, and key findings of developing artificial protection layer for lithium metal anode and optimized electrolyte formulation are demonstrated to improve the battery performance and safety. The Lithium Metal Ion battery utilizes metallic lithium as anode which has about 10-fold higher capacity than that of conventional graphite anode providing approximately triple amount of the energy density, both volumetrically and gravimetrically, of Lithium Ion batteries, and thus metallic lithium anode-based battery systems garner much of interests as the next generation system of lithium ion batteries. However, physicochemical instabilities of metallic lithium anode under the electrochemical processes induce formation of lithium dendrites and side reactions that potentially cause an internal electrode shorting and low Coulombic efficiency, which increases the risk of battery thermal runaway and short cycle life. To overcome the issues, the research team at KIST developed an approach to fabricate functionalized graphene-based artificial solid-electrolyte interphase layer, termed as Langmuir-Blodgett Artificial Solid-Electrolyte Interphase, onto the lithium metal anode along with a suitable electrolyte formulation to stabilize lithium migration reversibly occurring at the electrodes in Lithium Metal Ion batteries. The techniques developed by the team at KIST allow the battery to be able to maintain 80% of the initial performance after cycling for more than 1,200 times. The results may pave the way in surpassing the theoretical capacity limits of Lithium Ion batteries to further develop and produce high performance batteries for our daily electronics.